Tony Luke’s works directly with cattle farms in the Midwest which supplies the stores with top quality ribeye steak. All meat products are all-natural, antibiotic and hormone free. The vegetables used in toppings are grown in Southern New Jersey and prepared in the Luke family’s commissary in Philadelphia. Sandwiches are served on Liscio’s rolls, which are baked in store every day. Each sandwich and food item is cooked to order. Tony Luke’s is no longer just a sandwich shop in South Philadelphia. Tony Luke’s has turned into an international brand with 22 stores currently open in Bahrain and the Mid-Atlantic region. Tony Luke’s brings the real taste of South Philly to sports arenas, casinos, stand alone stores and in-line retail stores. Tony Luke’s has twice been hailed by Gourmet Magazine for quality and innovation, renowned by GQ Magazine, The New York Times and is a member of Philly Mag’s Hall of Fame. The sandwich shop is featured on episodes of Throwdown! with Bobby Flay, Dinner: Impossible, Man v. Food and Food Wars. Tony Luke Jr. is asked daily by people from around the world to send cheesesteaks from Philadelphia. Cheesesteak lovers can now enjoy the taste of Tony Luke’s at home from anywhere in the US by ordering online here. A true son of South Philly, Tony “Luke” Lucidonio Jr. is a man of many talents and enormous energy. Luke is an entrepreneur, restaurateur, actor and musician. Tony’s artistic gifts bloomed early as a student at the Philadelphia High School for the Creative and Performing Arts, where he began his performance career. Tony has appeared in many feature films including Invincible, 10th & Wolf and The Nail: The Story of Joey Nardone”, which he co-wrote and co-produced. Tony has written and produced songs for Billy Paul, A&M Records and even topped the CD Baby charts with his song, “Right Here”. Tony and his restaurants have appeared on TV shows including “Man vs. Food”, “Throwdown with Bobby Flay”, “Not My Mama’s Meals”, “Dinner: Impossible” and more. He is also​ creator and host of “Food Mashups“, a web series dedicated to finding the craziest food creations across the United States. 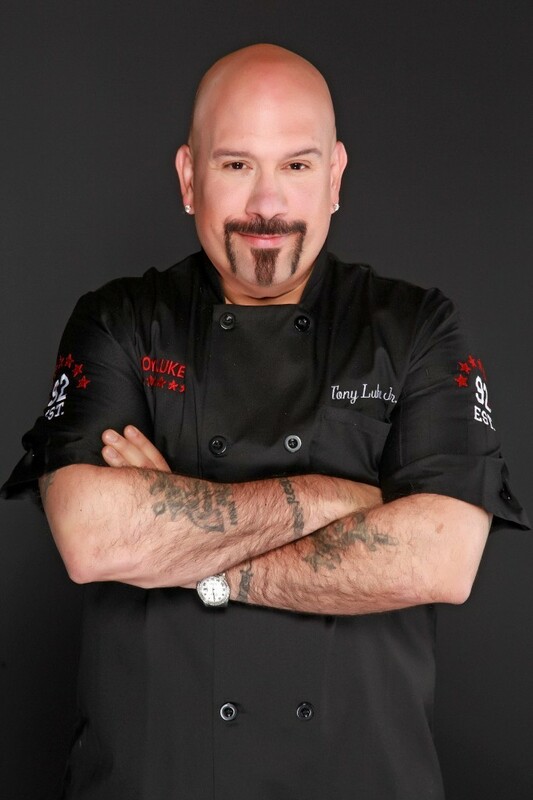 Tony appeared as a series judge on SpikeTV’s first culinary based reality show, “Frankenfood”. Each episode of “Frankenfood” features local amateur food innovators competing head-to-head in order to get their unexpected food concoctions onto the menu of a popular local restaurant, win a $10,000 cash grand prize and possibly create the next big food craze. Viewers will be taken back into the kitchen with these budding culinary artists to see how they whip up their inventive food combinations and find out the inspiration behind these dishes. It’s up to host Josh Capon, series judge Tony Luke Jr. along with a rotating panel of culinary experts serving as judges to decide which creative and often outlandish dish earns a spot on the menu. See episodes of “Frankenfood” here. View Tony’s reels, listen to his music and learn more at www.tonylukes.com/tony-luke-jr/.